Size: 470x550 mm, wide margins. Amsterdam, 1647 or later. 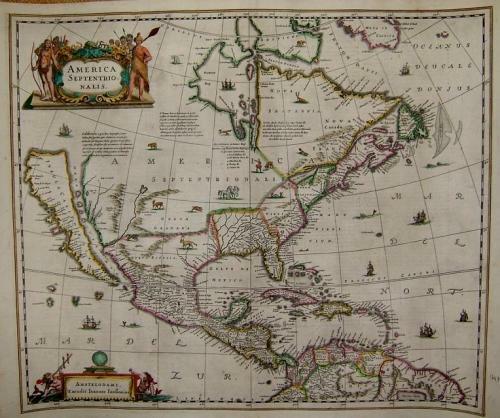 The only printed map of North America from the "Dutch Golden Age". This stunning map of North America had great influence in perpetuating the theory of California as an island due to its wide distribution through this preeminent Dutch publishing firm. The map is a careful compilation of various sources and represents the current state of cartographic knowledge at the time. The insular California is derived directly from Henry Briggs. The "Rio del Norto" originates in a large western lake and flows incorrectly into the "Mare Vermio". The cartography of the Gulf of Mexico and Florida is based on Hessel Gerritsz. On the east coast the region identified as "Novum Belgium" is greatly elongated, "Iames Towne" and a few place names from John Smith's map appear in "Nova Anglia". There is a single "Lac des Iroquois" in the Great Lakes region. The map is richly embellished with a variety of animals throughout the interior, with ships and sea monsters in the oceans. The title cartouche features several Native Americans and the imprint cartouche features two mermaids. Double-page engraved map with Latin text on verso. Overall in very good condition on strong clean paper. Second state of the map, with the Jansson imprint in the lower left and with Bbb signature on verso. Burden 245.